Only three teams remain unbeaten in Class 5A entering district play. What is more interesting is that none of the remaining unbeaten are ranked higher than fourth in the 5A poll. Instead, the top three spots are occupied by Mill Valley, Bishop Carroll, and St. Thomas Aquinas. Mill Valley’s only loss came 28-21 to a Staley (Mo.) team ranked in the top 3 in Missouri Class 5. The Jaguars have big wins over St. Thomas Aquinas and 6A No. 4 Derby this season. Defending champion Bishop Carroll dropped its season opener, 31-24 to Class 6A’s No. 3 Wichita Northwest. Since, the Golden Eagles have dominated the remainder of their Wichita City League schedule. Aquinas has losses to Mill Valley and 4A-I’s top-ranked team in Bishop Miege. Still the Saints are talented behind a stacked backfield that includes six capable ball carriers. Pittsburg is the highest ranked unbeaten team at No. 4. The Purple Dragons have breezed through SEK League competition and will be tested in a district that includes Aquinas, Blue Valley West, and Blue Valey Southwest. Meanwhile, perhaps no district contains the strength as District 3 where No. 1 Mill Valley, No. 5 St. James Academy, and unbeaten Bonner Springs will compete for two playoff spots. The fun begins this week when the No. 1 Jaguars travel to take on the No. 5 Thunder. KC Schlagle (4-2) – The Stallions are led on offense by junior Cornelius Ruff who has rushed for 485 yards and six scores. Senior receiver Ernest Taylor has a team-high 213 receiving yards to along with a pair of touchdowns. Lansing (3-3) – John McCall’s Lions have alternated wins and losses this season through six weeks. Lansing dropped a 35-28 decision to unbeaten Bonner Springs in Week 4, but were blown out against No.1 Mill Valley, 63-6 last week. Junior Quinton McQuillan leads Lansing with 682 yards rushing and nine touchdowns. KC Washington (1-4) – Washington is just 1-4 on the season because their Week 2 game versus African Centered College Prep (Mo.) was cancelled. The Wildcats only win came in a 32-20 defeat of KC Wyandotte in Week 4. The Wildcats finished 5-4 in each of the past two seasons; their best records since 2007. Leavenworth (0-6) – Leavenworth opened with a hard-fought 19-17 loss at Great Bend, then faced the upper echelon of the Sunflower League. Those five Sunflower League opponents have a combined record of 26-6. Former Immaculata quarterback Drew Sachen leads the Pioneers with 454 rushing yards and 179 passing yards. Wake Jackson has added 369 yards rushing and two scores. Topeka Seaman (1-6; 1-0) – The Vikings picked up their first win on Thursday night by beating Topeka West 71-20 to open district play. Seaman’s losses have come to opponents that are a combined 29-7. Dalton Cowan is a capable quarterback and Colton Moranz rushed for 158 yards and three scores in Thursday’s win over West. Shawnee Heights (0-6) – After 2014’s remarkable run to the state semifinals, the T-Birds have yet to get their first win this season. While the schedule has been packed with quality opponents, Shawnee Heights has averaged just 10 points per game and has been shut out twice. Topeka Highland Park (0-6) – The Scots are winless in Faron Kraft’s first year as head coach. Highland Park played their closest game back in Week 2; a 30-26 loss to KC Harmon. Since then, the Scots have scored just 12 total points. Topeka West (1-6, 0-1) – The Chargers opened with a 27-18 win over KC Wyandotte, but have dropped six straight. Last night West lost its district opener 71-20 to Seaman. The Chargers are giving up more than 53 points per game. Bonner Springs (6-0) – Coach Lucas Aslin has done a great job at Bonner Springs. The Braves sit just outside the 5A rankings, but remain unbeaten. Connor Byers is a great dual-threat quarterback. Byers has passed for 1,076 yards and 12 touchdowns, while adding 840 rush yards and 11 scores. Marcell Holmes is the other primary option out of the backfield with 515 rush yards and seven scores. Michael Amayo has 22 catches for 491 yards and seven touchdowns. St. James Academy (6-0) – The Thunder are 6-0 behind a solid defense and a rushing attack that averages nearly 270 yards per game. Quarterback Trey Keith leads the Thunder with 543 rush yards, while passing for 689 more yards and seven touchdowns. Keith, Jake Burgmeier, and Dylan Streeter have each scored five rushing touchdowns. Burgmeier has been out with an injury, but is expected to return for district play. Mill Valley (5-1) – The top-ranked Jaguars have been a great story this season. They backed up their Week 1 upset of St. Thomas Aquinas with a win over 6A-ranked Derby. Quarterback Logan Koch has completed 62 percent of his passes for 952 yards and 13 touchdowns. Koch has also rushed for 498 yards and eight scores. He’s protected by a solid offensive line and has a couple of weapons in Christian Jegen (503 yards, 6TDs) and Lucas Krull (310 yards, 6TDs) at receiver. KC Turner (2-4) – Turner’s wins have come against struggling teams in KC Washington and Bishop Ward. But the Golden Bears have also suffered close losses to Tonganoxie (48-39), Basehor-Linwood (30-29 OT), and KC Piper (35-29). Senior Andre Jackson has averaged 8.5 yards per carry in rushing for 544 yards and six touchdowns. Pittsburg (6-0) – Despite the graduation of star running back Alex Barnes and a veteran offensive line, the Purple Dragons have continued to roll to a 6-0 start. Sherrick Rogers returned to Pittsburg after an all-state year as a receiver at 8M-II Chetopa. Rogers is a dynamic athlete in the backfield along with bruising fullback Dante Menghini and quarterback Spencer Turnbull. Zack Roark, a transfer from Columbus, has provided an additional playmaker at receiver and safety. The Dragon offensive line doesn’t have the size that it did a season ago, but is quick and athletic. The defense has given up 34 total points and not all of those have come against the first unit. St. Thomas Aquinas (4-2) – After a Week 1 loss to Mill Valley, the Saints posted consecutive 42-13 wins over Blue Valley North and Northwest. Aquinas then dropped a mistake-filled 41-21 contest at 4A-I No. 1 Bishop Miege. The Saints got running back James Cosentino back in Week 3 and now have several weapons in the backfield including Sam Ramaekers, Duron Lowe, Sam Budetti, and Jacob Leikam. Karter Odermann continues to direct the Saints offense and is a threat to run and pass. Blue Valley Southwest (2-4) – Southwest is 2-4 under former Spring Hill coach Anthony Orrick. Collin Gallery has passes for 1,212 yards and 12 touchdowns this season. Leading receiver Kevin Woolworth has 29 catches for 403 yars and a pair of scores, while Daniel Foulon has 26 catches for 292 yards and two touchdowns. Zach Glynn leads the Timberwolves on the ground with 206 yards and six scores. Blue Valley West (2-4) – You won’t find many schedules more difficult that the Jaguars’ this season. Blue Valley West’s four losses have come to 6A No. 1 Lawrence (35-14), then 6A No. 2 Blue Valley (34-24), a 5-1 Blue Valley North team (28-7), and 4A-I No. 1 Bishop Miege (56-20). The Jaguars are a dangerous team especially with quarterback Nathan Wiles (6-4, 220). Kapaun Mt. Carmel (4-2) – Kapaun, behind quarterback Brock Monty, has averaged 29.3 points a contest with losses to Wichita Northwest, ranked No. 1 in Kansas in offense, and Carroll, ranked No. 2 in 5A. Kapaun has scored at least 28 points in five of six contests. Wichita Heights (4-2) – Heights took an upset loss, 16-6, at Wichita South in Week 2, and has played in two shootout victories, Dodge City (53-48) and at Wichita West (48-38). The Falcons shifted personnel along the offensive and defensive line before the West win last week. Heights has several backfield threats, including Garrett Haskins, Rodney Murphy, Dejaun Scott, and Myles Garner. Emporia (3-3) – Senior quarterback Tanner Taylor and an experienced group has helped the Spartans tie last year’s win total from a 3-6 season. Emporia has taken home losses to Washburn Rural and Junction City and at Topeka High, all quality Class 6A teams. In its victories, Emporia has tallied 72, 42 and 40 points. Andover (1-5) – Andover went 5-1 in non-district play last season and finished 7-2, but Heights, Kapaun and Andover all finished 2-1, and Andover was denied a playoff spot due to the district points tiebreaker. Andover was 6-0 non-district, 9-1 overall in 2013; 5-1, 8-3 in 2012. This season, the Trojans have three losses by six points or fewer. Great Bend (4-2) – Second-year coach Tony Crough has made big strides with the Panthers and improved their record from 3-6 last season. The Panthers are 3-0 in games decided by 11 points or fewer. Last season, Great Bend went 1-3 in contests 14 points or fewer. Opponents have outscored the Panthers 157-155. Jacob Murray has 917 passing yards, and Bryce Lytle has a Western Athletic Conference-best 577 receiving yards. Dominique Rideaux leads the defense with 10 TFLs. Salina Central (3-3) – Salina Central opened 0-2, then won three in a row before a 26-7 loss at Hutchinson last week. The Mustangs averaged 37.8 points per contest in the first five games before slipping back in Week 6 in a big loss to Hutchinson. Dalton Peters is a workhorse for the offense in rushing for 1,315 yards and 16 touchdowns on 189 carries already this season. Salina South (3-3) – South has already lost more games than it did last season in a 10-2 year. The Cougars have averaged 27 points a game, including 30 in a 32-point loss to Derby last week. South had lost to McPherson (14-7) and against Hutchinson (37-14) before the Derby defeat. Jacob Yarochowicz has passed for 1,141 yards and 12 scores, while Dylan Becker leads the team with 30 receptions for 580 yards and seven scores. Newton (1-5) – The Railers’ lone victory is a 28-20 win versus Arkansas City in Week 4. Newton had scored 40 points in its first four losses before a 54-34 loss at Maize last week. Bishop Carroll (5-1) – The Eagles have returned to its usual ways after a 31-24 Week 1 home loss to Wichita Northwest. Carroll has won each game since by 33 points behind first-year senior starting quarterback Jake Allen. Senior linebacker Will Honas and defensive lineman Chris Dugan have both been lost for the season with knee injuries. Maize South (5-1) – Standout quarterback Korie Frausto has led the Mavericks to a 3-0 mark in games decided by seven points and 39.3 points per contest. Last season, the Mavericks went 8-3 with a 5-1 start and averaged 27 points a game. Valley Center (3-3) – Valley Center, which has not made the state playoffs since 1998, has continued to make strides since 0-8 two years ago to 3-6 last season. The Hornets were 2-4 entering district play in 2014; the difference came in a 20-14 road win versus Andover in Week 4. Valley Center is 2-1 in games decided by six points or fewer. Maize (1-5) – Maize has had problems on both sides of the ball, mainly defensively. Last season, the Eagles allowed 35 points a contest in finishing 4-5. Maize has permitted 34.7 a contest this fall. Maize has not had a loss closer than 13 points and won 54-34 versus Newton last week for its lone victory of the season. Goddard (3-3) – The Lions, a playoff team last season with a 3-7 record, had just a pair of victories entering districts last year. 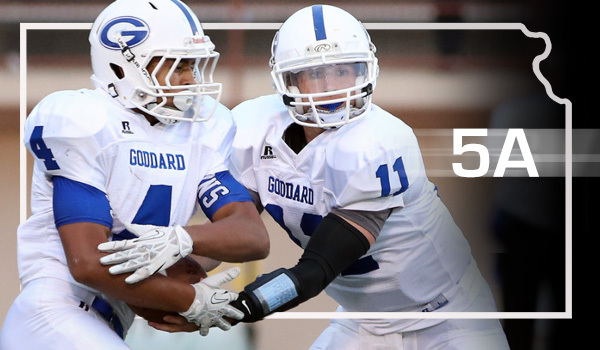 Goddard had tallied just 74 points en route to a 2-4 start in 2014. This season, the Lions are much improved at 169 points. Goddard has scored at least 21 points in each contest, but is 1-3 in games within seven points. Goddard-Eisenhower (3-3) – Like Goddard, Eisenhower has made big strides this season. Eisenhower, with eight offensive and nine defensive starters returning from a 2-7 team, is 3-1 in games within 10 points. That includes one of the bigger upsets this season, a 29-20 home win versus Maize South in Week 3. Eisenhower has tallied 144 points. Through six games in 2014, the Tigers had just 71. Arkansas City (1-5) – Arkansas City opened with a 42-25 win against Winfield and then has dropped five straight. The Bulldogs have tallied just 95 points and allowed 27, 28, 55 and 56 points in its last four contests. Liberal (1-5) – The Redskins, expected to be a playoff contender this season, are 0-5 against Kansas schools and lost its four contests by 29, 69, 42 and 38 points. Liberal has just 31 points in its five defeats.